Lake Ashi is considered the center of Hakone. The crater lake has views of Mt. Fuji, one of the most revered shrines in Japan, and outdoor activities to enjoy during the seasons. Reaching the Lake from Hotel Okada is just a short bus ride up the mountain from the bus stop located behind the hotel or from Hakone Yumoto Station. Take a bus headed for Moto-Hakone or Hakone Machi to reach the shores of Lake Ashi. A new and popular activity is kayak rentals to see and explore the lake from new and special angles. 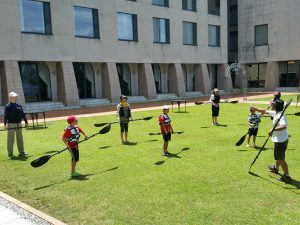 The lake is calm and the surrounding mountains are a wonderful natural backdrop to this amazing activity. 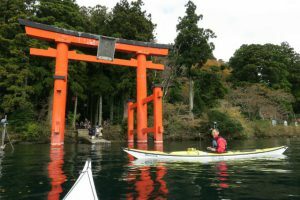 On a kayak you can get up close to the famous vermillion torii gates of Hakone Shrine. 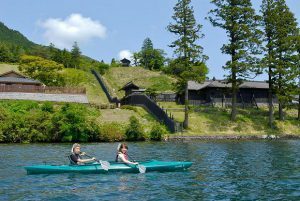 You can also paddle along the wooded shorelines of Moto-Hakone. The experience runs from late spring to early fall and is a great way to cool off from the humid and hot Japanese summer heat. 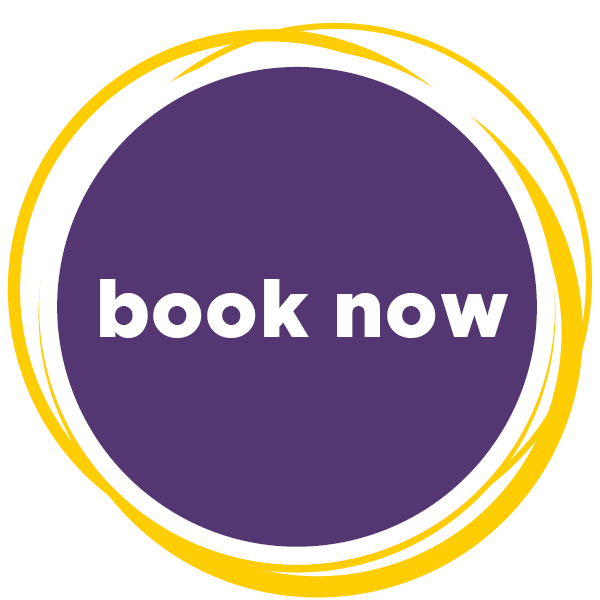 For this Hakone experience you can choose from different time lengths, routes, and whether or not you would like to have a guide accompany you. All necessary equipment such as life vests, kayaks, and an insurance are included in your adventure. Lake Ashi is a wonderful place to explore. The lake is said to be home to a nine headed dragon that once terrorized the people around the lake until a monk came to calm the beast. The dragon still lives at the bottom of the lake and the traditional festivals and offerings to the dragon still carry on today. The lake itself is a crater lake created after the volcanic eruptions that made the surrounding mountains and later Mt. Fuji. 25 minutes by car from Hotel Okada. If you are using public transport, take the H bus Hakone-machi Line【for Hakonemachi-ko 】, and get off at「Hakone hotel-mae」about 6 minutes on walk. 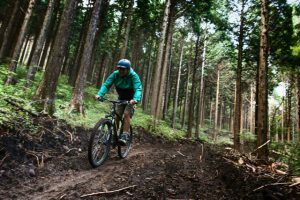 Hakone Mountain Ripper in the Sengokuhara highlands of Hakone also provides a wonderful mountain biking tour around the Lake Ashi area. Enjoy a knowledgeable local guide as you explore the forests, trails, and even hidden shrines. 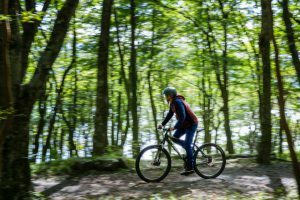 The mountain biking experience in Hakone has a number of difficulty levels giving you the option to enjoy a leisurely pace with the family or a more challenging route if you are more experienced. The Sengokuhara area is a flat plain surrounded by the rugged ridges of the Hakone mountains. The area is popular for its natural beauty, hot springs, and collection of museums. You can choose from one of their well-maintained bikes, helmets, and ride with peace of mind because you will be covered by accident insurance. 40 minutes by car from Hotel Okada. If you are using public transport, take the T bus Togendai Line【for Togendai 】, and get off at「Palace hotel hakone-mae」about 10 minutes on walk.